The Wonky Nines quilt is finally all quilted. It is not my best quilting, but it is d-o-n-e. 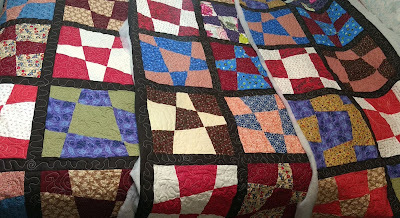 I had started piecing this quilt in 2013 and when I started quilting it, I decided to use an inexpensive poly batting. That was my big mistake. I hate quilting on poly batting. From now on, I will use cotton or a cotton/poly blend. I have some "blend" battings in my stash from a great sale I found a while back. So anyway, here is the photo of the three pieces laying across my bed. It is a queen bed, so this is a pretty large quilt. The back is pieced also. Here is a surprise that I found when I turned one of the sections over. I love that positive/negative in complementary colors. Another thing that I finally remembered to photograph is my bobbin storage. My Janome 6600 has two vertical spool pins - but I typically just use one of them for a cone of thread. So I decided that I could put filled, spare bobbins on the other one. It is very handy to have them easily reachable when one runs out. As you can see, I have six sitting on there all ready to press into service as needed. If I took the spool cap off the bottom, I could add one more. Does anyone else have a trick/hack for their machine to share? That's a great about the bobbins. The quilt looks good. Yes, great tip! Glad you have made so much progress. The quilting looks good to me...even and consistent! I love that Wonky Nines quilt. So fun. Great idea to stack your bobbins like that too. 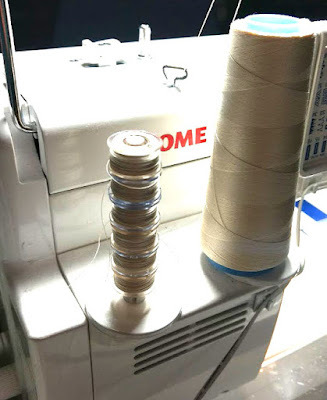 I have a second thread holder that is never in use, but I also don't tend to do projects that require the filling of more than one, or at very most two bobbins. I'm going to steal the bobbin tip! I hate, hate having to stop when I'm sewing to fill a bobbin. It's one of those tips that makes you think "now why didn't I think of that". Thanks. Lovely quilting. This is a fun quilt, Gene! You're on the home stretch with it :) Thanks for the bobbin storage tip, too. Great idea for bobbin storage. 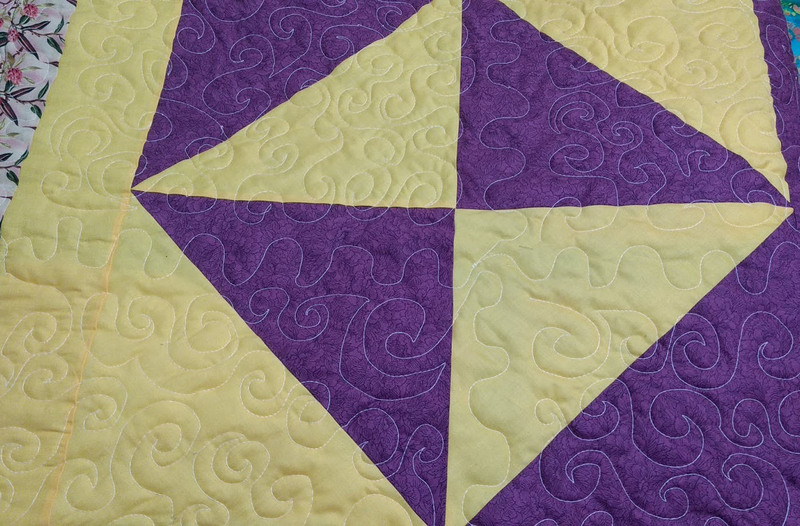 The wonky nines quilt is in fun colors. Congrats on another almost finish. Love your quilt.....no haystack for me.....wish I did have.